Fishing for nocturnal brown trout is definitely not for the faint of heart. I've spent several evenings tossing around large mouse patterns in leau of a bug hatch that never came to fruition. Tonight was different though. Its mid August and the big bugs of June are long gone. This would be my first trip dedicated to mousing. 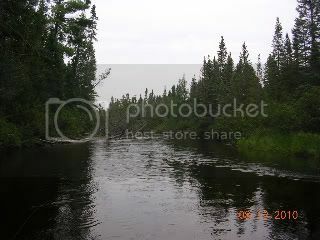 I planned to fish a very familiar section of the AuSable that I would be comfortable navigating after dark. Since I didn't know how long it would take to fish after dark I decided to scout another section of water to fill out my evening. I tied on a hopper pattern and made my way downstream looking for deep holes and fly grabbing branches. This section was slow moving and mid thigh deep at best. Perfect for my first mousing adventure. Some small brook trout kept things interesting while scouting. Next, I rigged my 6wt with an attractive rat, organized my pack, and took a nap in my truck. About 15 minutes after sunset I started throwing the mouse around log jams and other trouty structure. Not too sure about what the evening would bring I was very happy to begin fishing with some receding sunlight. As I carefully slipped downstream I attempted to remember what the river looked like during the day and make my casts accordingly. 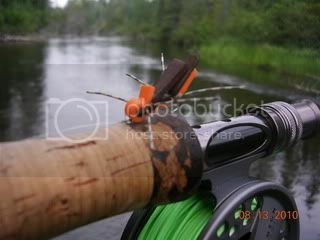 For the retrieve, most of what I have read recommends a down and across swing, similar to fishing traditional streamers or wet flies. I varied my retrieve with both the swing and also added some twitches to emulate a struggling rodent. By this time, I'm confident with my mouse technique, however, I'm engrossed in total darkness and the bats are dive bombing my fly rod. The moon made a short appearance before following the sun behind the treeline. Did I mention its Friday the Thirteenth? Note to self: when fishing at night, check the moon phase! The new moon was two days ago and its very dark. To make matters worse, there is slight fog due to the humidity which makes flashlight navigation next to impossible. Remember my mentioning that this is a familiar stretch of water and scouting before night? I cannot stress the importance of knowing your nocturnal waters very well. Not only will you spook the fish if you don't, but its also downright dangerous to be wading in unfamiliar waters after dark. Back to fishing. I did my best to continue to cast toward productive trout hideouts. After a half hour or so, I fish absolutely crushed my rat...very cool! I'm stoked now and not being able to see is trivial. I cast in the same spot again and he crushed the rat with a vengeance! No hook up. I continue fishing and find another player. Missed it first, then hit again on the second cast. I pricked him and felt the pull...then he was gone...damn. Moving on I struggled to fish a few spots due to the black hole I was walking through. Near the end of my stretch of water I remembered a fallen tree with a nice riffle behind it. I placed the rat perfectly and let it swing. Trout #3 attacks and I set the bone hard, briefly hooking up, and coming loose. The trout won tonight but I cannot say I didn't have my chances. The strikes can be explosive! Great blog...Felt like I was right there with you as you hunted those giant browns. Too bad the following day didn't produce with the hoppers, but at least we rolled a few fish and boated one nice brookie on streamers. Thanks Rexman! I had a great time on the main branch despite our lack of Hopper activity. We'll have to make another trip this fall and concentrate on streamer fishing. Tight lines! Love the bullet points at the end of the post. Nice way to wrap up a well written story. Can't wait for some bird hunting and salmon fishing this fall.